Civilsdaily, an online startup that aggregates news relevant for civil services aspirants, has raised an undisclosed amount in seed funding from Malgharia Advisors’ co-founder Manoj Kumar and some affluent individuals it didn't name. The startup, run by Apeirogon Technologies Pvt, will use the money to expand its team and develop the product, besides exploring upcoming sectors of news consumption, co-founder Shikhar Sachan said. “We will add a Hindi module for daily news cards to cater to an audience that does not have a reliable medium for preparation. Additionally, we have plans to upgrade our content management system to release niche offerings in other sectors of news consumption,” Sachan added. The funding was facilitated through ‘Enablers’, a web-based deal enabling platform for startups. 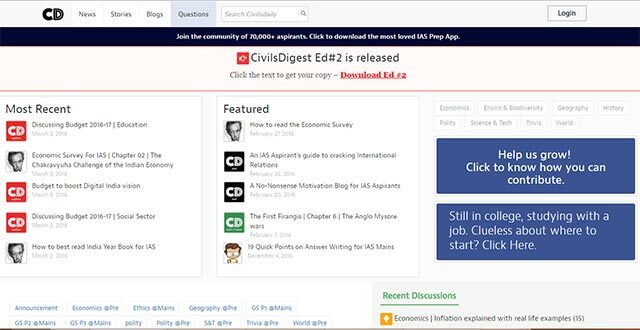 Civilsdaily was founded in 2015 by Sachan and Rohit Pande. The startup, which has an Android app, aggregates and curates news items that are relevant for test preparation. An aspirant can also browse through material available in several categories such as economics, environment, geography, history, polity, science and tech, and world events. “Digital evolution of traditional media has not been able to change the context and quality of news for several consumer segments. Apeirogon is redefining the way news can be optimized for the context and served to the communities of consumers digitally," Kumar said. Digital media startups have received a lot of investor interest over the past year. Last month, media portal Newslaundry raised funding from Omidyar Network and some angel investors. In January, Times Internet Ltd acquired Gurgaon-based news curation app Viral Shots for an undisclosed amount. Personalised news curation app Hotify raised $150,000 (Rs 1 crore) in seed investment from Rajasthan Angel Innovators Network’s co-founder Mahavir Pratap Sharma in December. Inshorts, previously known as News in Shorts, raised $20 million (Rs 127 crore) in a Series B round funding from existing investor Tiger Global Management last year. In February last year, Ver Se Innovation Pvt Ltd, which runs mobile news aggregation and book downloads app DailyHunt, raised $40 million from Falcon Edge Capital, Omidyar Network Advisors, Matrix Partners and Sequoia Capital India in a Series C round, just four months after raising an $18 million Series B round.